Formulation: Liquid. In 50mM MOPS, pH 7.5, 300mM sodium chloride, 0.25mM DTT, 0.1mM EGTA, 0.1mM PMSF, and 25% glycerol. Scientific Background: ERK1 is a protein serine/threonine kinase that is a member of the extracellular signal-regulated kinases (ERKs) which are activated in response to numerous growth factors and cytokines. Activation of ERK1 requires both tyrosine and threonine phosphorylation that is mediated by MEK. ERK1 is ubiquitously distributed in tissues with the highest expression in heart, brain and spinal cord. In vitro studies indicate that ERK1 phosphorylate both nuclear and cytoplasmic proteins. Activated ERK1 translocates into the nucleus where it phosphorylates various transcription factors (e.g., Elk-1, c- Myc, c-Jun, c-Fos, and C/EBP beta). The consensus primary sequence for substrate phosphorylation by ERK1 has been identified as -Pro-Leu-Ser/Thr-Pro-. ERK1 has been implicated in the control of a broad spectrum of cellular events in many types of cells. In somatic cells, ERK1 activation seems to be triggered after exit from a quiescent state (in G0 or G2) only and then inactivated by entry into a proliferative state. 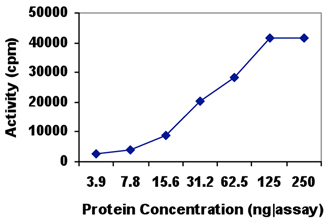 SDS-PAGE analysis of Erk1 (human), (recombinant).